In this work we present the industrial application of fiber lay-down models that enable an efficient simulation of non-woven structures. 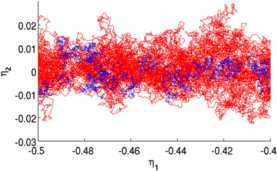 The models describe the deposition of fibers on a moving conveyor belt with the help of stochastic differential equations on manifolds. The model parameters have to be estimated from more complex models in combination with measurements of the resulting non-woven. In the application we discuss especially a three-dimensional fiber model for a typical industrial problem from non-woven production processes. Technical textiles have attracted great attention to diverse branches of industry over the last decades due to their comparatively cheap manufacturing. By overlapping thousands of individual slender fibers, random fiber webs emerge yielding non-woven materials that find applications e.g. in textile, building and hygiene industry as integral components of baby diapers, closing textiles, filters and medical devices, to name but a few. A typical method of production is given by melt-spinning processes, see Figure 1 for a corresponding plant. There melted polymers are extruded through narrow nozzles leading to plenty single fibers. Then these fibers are stretched and spun until they solidify due to cooling air streams. The latter also account for swirling of the fibers before they are laid down on a moving conveyor belt. The resulting fiber web eventually passes through several processing steps of reworking and reinforcement before the finished product is obtained. The quality of the non-woven can be measured, for example, in terms of homogeneity, basis weight, or permeability and is already determined to a great extend by the fiber deposition. Fluctuations in these properties due to stochastic influences during the production process cause difficulties for the manufacturer, such as unintended holes in filter materials. An objective in industry is the simulation of the deposited fiber web and its optimization with respect to the desired characteristics. Since in this process, raw material costs play a more decisive role as compared to the costs of procedure, the optimization aims at raw material saving that corresponds to a small value of basis weight of the non-woven, while quality assurance. The primary objective is to generate the microstructure of the technical textile given the relevant production parameters. 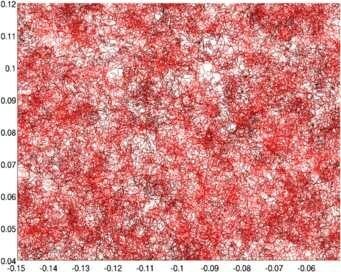 Then, on the one hand, the microstructure will be further investigated with respect to the above quality parameters. 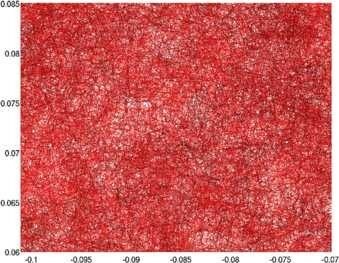 On the other hand, a microstructure simulation can be used to predict material properties of the textile. The material properties can be optimized solving the associated inverse and optimization problems. Finally, this leads to a complete virtual material design of technical textiles. Plant for melt-spinning process (Photo by Oerlikon Neumag). Since the mathematical treatment of the whole process at a stroke is not possible due to its complexity, a hierarchy of models that adequately describe partial aspects of the process chain has been developed in research during the last years. 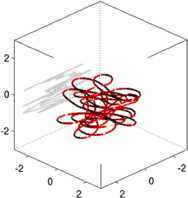 In  the conjunction of those models has been elaborated using asymptotic analysis, similarity estimates and parameter identification. 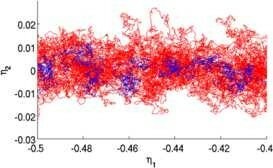 More precisely, the description of the fiber dynamics in turbulent air flows has been realized by a stochastic generalized string model that has been deduced from a special Cosserat rod under Kirchhoff constraint, consult [2, 3] for its derivation. 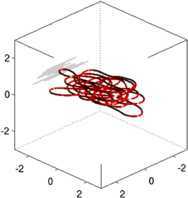 This provides the basis for the software tool FIDYSTa that enables the full simulation of fiber motion under the influence of surrounding turbulent air flows up to the fiber lay-down on the transport belt. 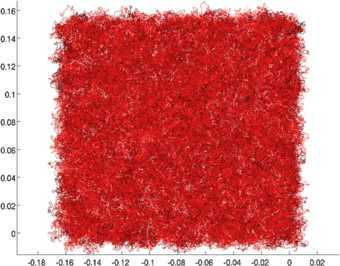 In this manner, the microstructure of virtual fiber webs can be in principle generated. However, this approach is computationally expensive and the complexity is strongly affected by the number of fibers. For this reason, a class of stochastic surrogate models has been proposed in order to compute only the image of the deposited fiber web, instead of describing the full fiber dynamics that lead to this web. 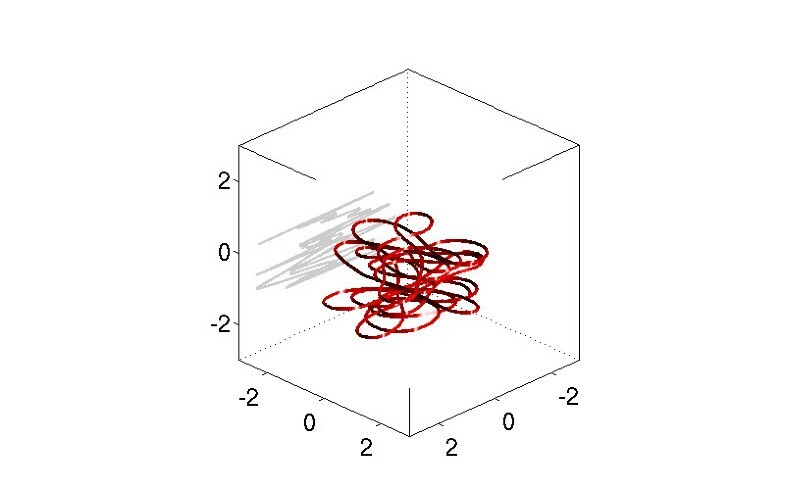 These surrogate models have in common the structure of a system of ordinary stochastic differential equations that enables the fast computation of a considerable number of fibers. 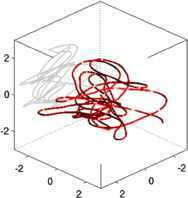 They contain parameters that are related to the physical production process, as for example turbulence influence and fiber coiling, and that have to be identified from the full simulation of a few fibers with help of the complex string model. Based on the original two-dimensional version in , the surrogate models have been frequently improved within the last years. This includes the addition of a moving conveyor belt  or, more general, the consideration of more specific types of production processes as for instance rotational spinning processes . Further enhancements are given by a smooth version in  where the curvatures of the fibers are taken into account, and by modelling the lay-down in three dimensions [7, 8]. The latter has been intended as first step into a realistic generation of three-dimensional microstructures that can be used for study of flow resistance and elasticity of the non-woven. 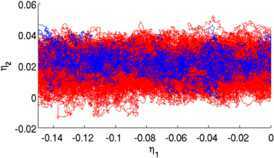 The mathematical analysis of these models is sophisticated due to degeneracies of the associated Fokker-Planck equations. The trend to equilibrium for the original two-dimensional model has been investigated using Dirichlet forms and operator semi-group techniques in , with a hypocoercivity method in  and with probabilistic methods in [11–13]. The higher-dimensional models have been accordingly analyzed in [13, 14]. With the help of various techniques from asymptotic analysis connections between these models have been shown and model reduction in the situation of large or small turbulence have been performed in [4–8]. 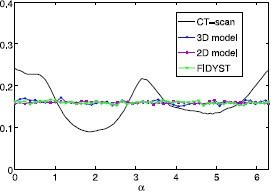 A possible strategy for estimating the parameters of the two-dimensional models has been provided as a heuristic approach in  which has been successfully tested by FIDYST simulations of transversal as well as rotational spinning processes in the stated source. In  an extension of this identification strategy to the three-dimensional case has been proposed on condition that information about the fiber orientation is available. In this work we realize this approach in a real industrial problem for the first time. At the example of a pilot plant of the company Oerlikon Neumag, we discuss the calibration of the smooth three-dimensional surrogate model and illustrate the computation of corresponding fiber webs. For this we need both the full simulation of a few representative fibers with regard to the problem setting and image processing data from CT-scans of the resulting non-woven. This paper is structured as follows. At first, we recapitulate the class of surrogate fiber lay-down models developed in the above mentioned papers. This is done in Section 2 where we use a description that can be embedded in the context of geometric Langevin equations on regular submanifolds as investigated in . Via this approach, the highly geometric nature of the class of fiber lay-down models is illustrated. In Section 3 we describe a strategy for estimating the parameters of the surrogate models. The application of the models to the production process in the pilot plant is done in Section 4 where we are able to simulate virtual fiber webs that are numerically investigated with regard to their quality characteristics. As mentioned in the Introduction, in this section we recapitulate the class of surrogate models developed in [1, 7, 8, 13, 15]. 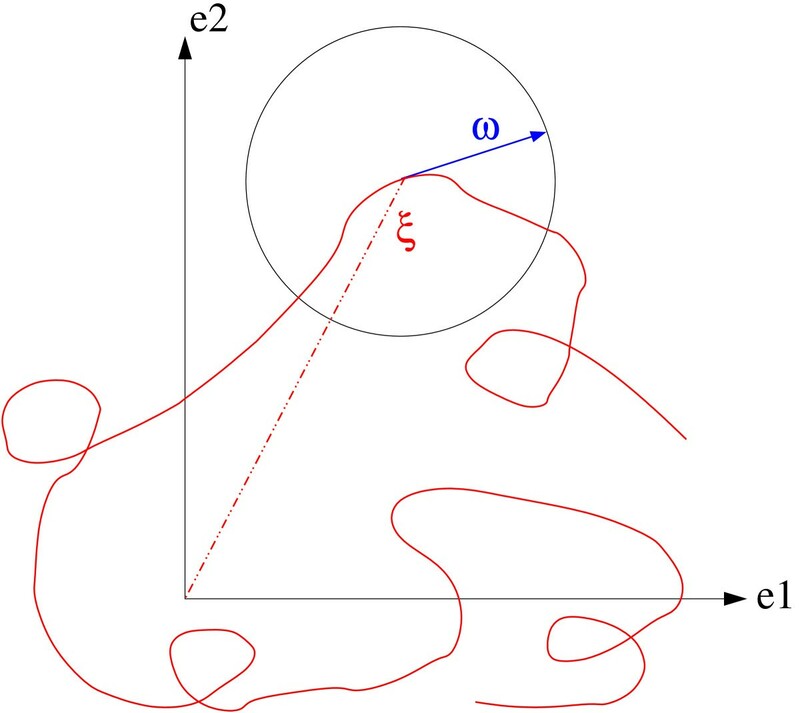 In the surrogate fiber lay-down models the paths of the deposited fibers (as images of arc-length parametrized curves) are described by simplified stochastic differential equations. For this purpose, distinctive process parameters that influence the form of the fiber web are incorporated. These are the typical throwing ranges of the fibers and their coiling behavior, whereas the deposition itself is perturbed by some random force which is affected by the entanglement of the fibers above the lay-down region. Other characteristics involve the fiber stiffness and the fiber orientation in space. Additionally, depending on the production process, different specifications can be handled using appropriate reference curves. In this work we restrict ourselves on the situation of a transversal spinning process, that means the fiber lay-down starting from fixed spinning positions onto a straight moving conveyor belt. Therein the belt velocity as well as the spinning speed are predetermined parameters given by the production process. The other parameters have to be appropriately estimated, see Section 3.
see [8, 13]. W denotes a d-dimensional standard Brownian motion. 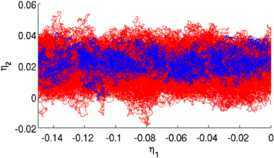 For more details on manifold-valued stochastic differential equations, see e.g. . Here the arc-length parametrized curve ξ : R 0 + → R d represents one deposited fiber. ξ is really arc-length parametrized since ω lives on S d − 1 , compare Figure 2. The drift term in the second equation models the coiling behavior of the fiber, where Π [ ω ] : = I − ω ⊗ ω denotes the projection of the tangent onto the sphere S d − 1 with I the identity matrix and x ⊗ y = x y T . The throwing ranges of the fiber can be controlled with the help of a suitable potential V. The second term in the equation for ω describes a Brownian motion on S d − 1 with constant noise amplitude A ∈ R 0 + and expresses the stochastic forces, i.e. the effect of the turbulent air flows that perturb the deposition of the fibers as desired. We remark that the basic model (1) can also be viewed as a geometric Langevin equation having spherical velocities, see . Scheme ( d = 2 ) of fiber curve ξ with normalized tangent ω .
d ξ t = ω t d t , d ω t = − Π [ ω t ] ∇ V ( ξ t ) d t + ν t d t , d ν t = ( ω t ⊗ ν t ) ∇ V ( ξ t ) d t − λ ν t d t − | ν t | 2 ω t d t + μ Π [ ω t ] ∘ d W t .
Therein, the parameter μ ∈ R 0 + takes on the role of the noise amplitude, whereas the stiffness of the fibers can be related to λ ∈ R 0 + . The connection to (1) is given by the white noise limit (compare ), i.e. the basic model can be viewed as a model for non-stiff fibers. ω = τ ( θ ) : = τ d − 1 ( θ 1 , … , θ d − 1 ) , ν ( θ , κ ) = ∑ i = 1 d − 1 κ i n i ( θ ) . and the spherical unit vectors n i are given by n i : = 1 | ∂ θ i τ | ∂ θ i τ . So note that the parameters take values in θ ∈ R / 2 π Z × ( 0 , π ) d − 2 (or in R / 2 π Z in case d = 2 ) and κ ∈ R d − 1 respectively. with some finite constant C > 0 . Here the empty product is again equal to 1 in case d = 2 . In the basic case we obtain the stationary distribution by integrating (5) over κ. Now that we have the abstract framework available, we recur to the application point of view and look at the essential cases d = 2 and d = 3 more closely. 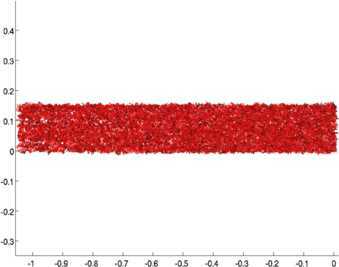 d ξ t = τ ( α t ) d t , d α t = − n 1 ( α t ) ⋅ ∇ V ( ξ t ) d t + A d W t .
A virtual fiber web can now be simulated by simultaneous use of this model for a large number of fibers, neglecting the influence of fiber-fiber-contact. The reference points indicating different spinning nozzles are included by adding an appropriate constant to the ξ t -process. Using this 2D model, for example, the basis weight distribution of the non-woven can straightforwardly be determined assuming a uniform thickness of the fibers. d ξ t = τ ( α t ) d t , d α t = − n 1 ( α t ) ⋅ ∇ V ( ξ t ) d t + κ t d t , d κ t = − λ κ t d t + μ d W t .
This is a natural smoother version of (6). See also  for a similar model. The moving conveyor belt can be included in (6) or (7) as an additional reference curve, i.e. gives the deviation of the fiber from a reference point determined by the position of the corresponding spinning nozzle, where v = v belt v in ≥ 0 defines the ratio between belt speed and spinning speed of the fiber, see . The image of the fiber on the belt, denoted by ( η t ) t ≥ 0 , is then obtained by η t = ξ t − v t e 1 . Unfortunately, there is no explicit computable stationary state available in case v > 0 . For a non-moving conveyor belt ( v = 0 ) the equilibrium is given by (5). d ξ t = τ ( α t , θ t ) d t , d α t = − p ( ξ t , α t , θ t ) d t + 1 sin θ t κ 1 , t d t , d θ t = − B q ( ξ t , α t , θ t ) d t + B κ 2 , t d t , d κ 1 , t = p ( ξ t , α t , θ t ) κ 2 , t cos θ t d t − κ 1 , t κ 2 , t cot θ t d t − λ κ 1 , t d t + μ d W t ( 1 ) , d κ 2 , t = − p ( ξ t , α t , θ t ) κ 1 , t cos θ t d t + κ 1 , t 2 cot θ t d t − B λ κ 2 , t d t + μ B d W t ( 2 ) . d ξ t = τ ( α t , θ t ) d t + v e 1 d t .
Exemplary fiber trajectories computed with (9) for varying parameter B with fixed parameters λ = 1 , μ = 1 , v = 0 and chosen potential V ( ξ ) = 1 2 ∥ ξ ∥ 2 are illustrated in Figures 4-6. 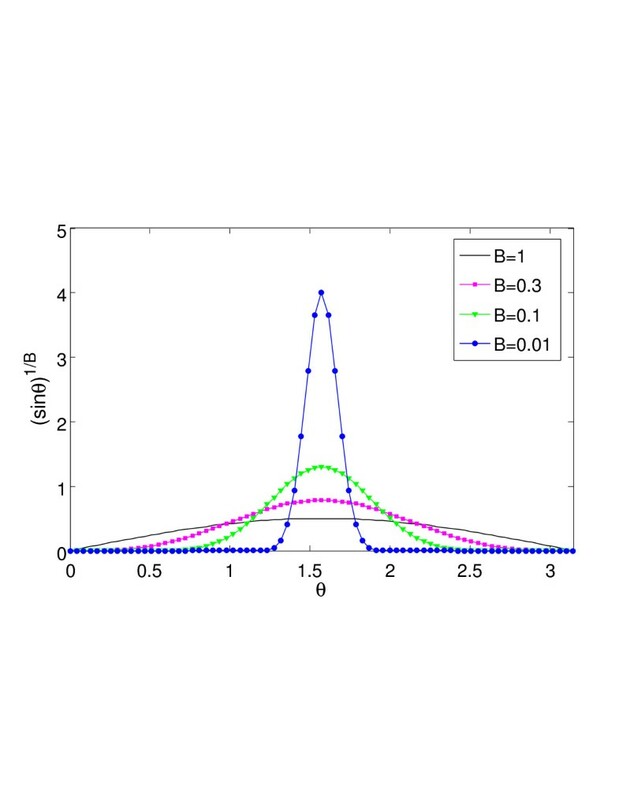 Behavior of the stationary θ -density for decreasing B . Behavior of fiber trajectories in dependence on the weighting parameter. Here: B = 0.1 . 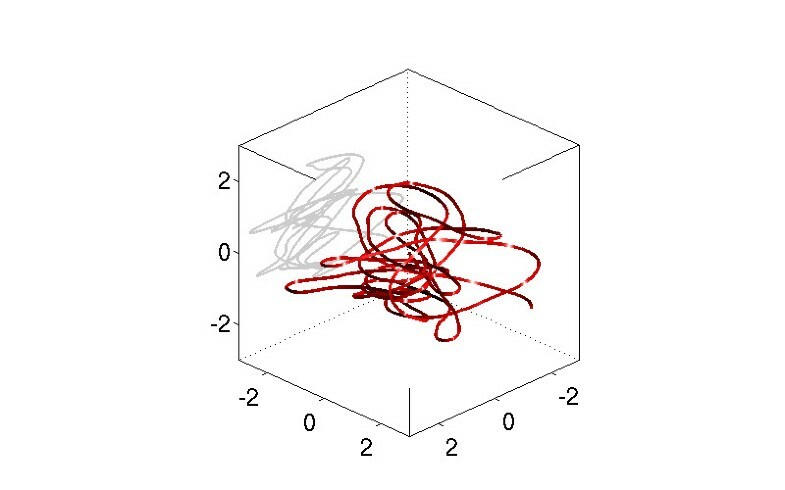 Behavior of fiber trajectories in dependence on the weighting parameter. Here: B = 0.01 . 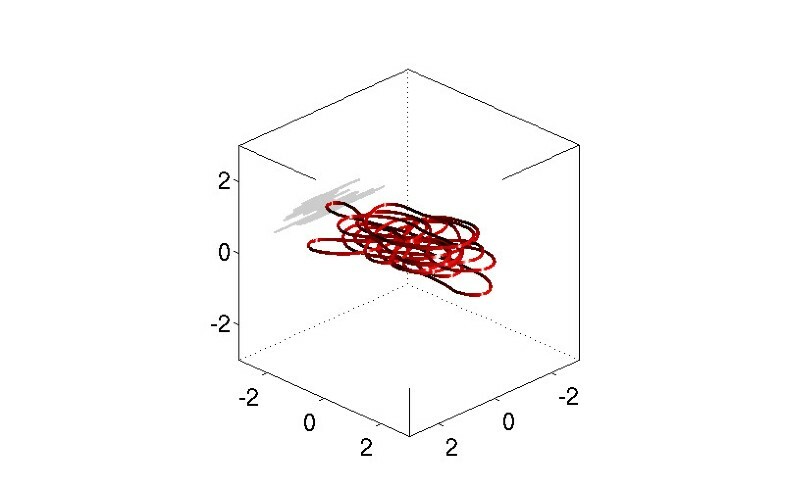 Behavior of fiber trajectories in dependence on the weighting parameter. Here: B = 0.001 .
where σ 1 , σ 2 > 0 represents the standard deviations of the fiber throwing on the belt, compare Figure 7 for a specification of the coordinate system. Furthermore, Φ denotes a confining potential taking account of the location of the belt, such that ξ 3 is restricted to [ 0 , d f ] , where d f denotes the thickness of the non-woven. Sketch of fiber lay-down and fixing of the coordinate system. where D fid indicates the data sample obtained from a FIDYST simulation. This can be solved by a relaxated quasi Newton method with unit Jacobian, i.e. P ( n + 1 ) = P ( n ) + ω [ F ( D sur ( P ( n ) ) ) − F ( D fid ) ] and starting point P ( 0 ) = F ( D fid ) , compare . We note that is a very good estimator for P, if the fiber process is close to its stationary state (5) with d = 2 , i.e. for adequately large data sample and small speed ratio v, two conditions which are usually fulfilled in the production processes considered here. It is worth mentioning that this choice of is completely detached from the white noise limit situation and can therefore be used for larger ranges of applications compared to . which allows us to compare the densities. Assuming that the fiber lay-down process is close to equilibrium, or in other words, if v is sufficiently small, we can identify the parameter B without great effort. In that case, we demand the equality of the standard deviation σ B of the θ-marginal of the distribution function obtained from the CT-scan, denoted by p ˘ θ ( C T ) , and the explicitly computed standard deviation σ ¯ B of the θ-marginal of the stationary distribution (10) of our model (with v = 0 ). The latter reads σ ¯ B = ( ∫ 0 π C B ( sin θ ) 1 B ( θ − π 2 ) 2 d θ ) 1 2 with normalization constant C B − 1 = ∫ 0 π ( sin θ ) 1 B d θ . Besides, the influence of the belt speed on the size of B is expected to be small in contrast to the other parameters, since it involves the deviation from the planar structure. In the case of very large v, the estimation of B can be straightforwardly embedded in the above heuristic identification approach with a little more effort. For our purposes, however, the described identification strategy will turn out to be adequate anyway. In the following we want to demonstrate the adaptation of the surrogate models on the basis of a industrial test case describing a real non-woven production process. From a pilot plant of the company Oerlikon Neumag process data have been available that have been used to initialize FIDYST simulations of the full process. Plant specific parameters, such as machine geometry and prevailing air flows have been included in these computations. In addition, an associated non-woven product has been produced by the pilot plant with the same configuration data. Pieces of this non-woven have been cut and have been analyzed in CT-scans. The statistics of the fiber orientation in the non-woven given as image processing data (IPD) complement the FIDYST informations as described in the previous chapter. We discuss two different data samples, denoted by sample I and sample II. Associated characteristic values and data sizes are summarized in Table 1. The resolution of FIDYST is something to be viewed critically. A more accurate resolution increases the effort and leads to unreasonable computational costs, compare Chapter 1. At least the surrogate models use the same grid sizes and they can be viewed as optimal discrete substitutes for FIDYST, see also below. The different numbers of IPD points indicate a different usable sample size of the pieces of nonwoven. A larger number of points leads to smoother α-marginals p ˘ α ( C T ) ( α , θ ) , compare Figures 8, 9, otherwise, it is not relevant. The essential difference between the two samples is the belt speed. Nevertheless, the speed ratio v is sufficiently small in both cases, which can be ascertained by the comparison between the standard deviation σ ¯ B and the one of our model with given v using Monte-Carlo simulations. Thus the calibration of the surrogate model (9) is carried out as described above. The estimated parameters are summarized in Table 2. 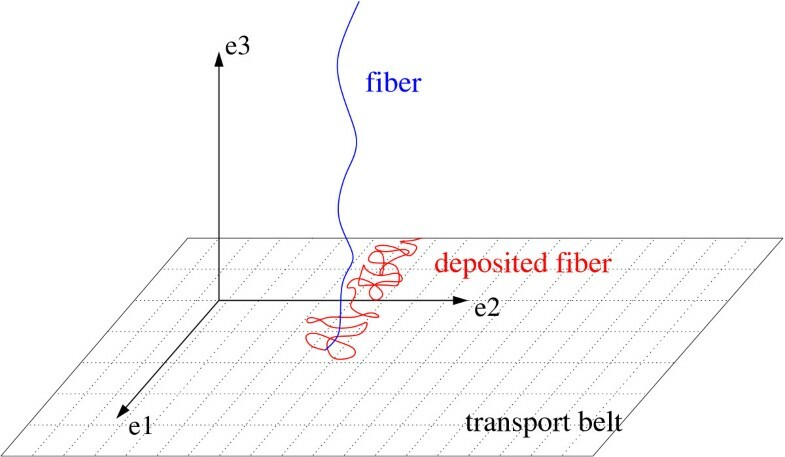 In Figures 10-13 we illustrate a comparison of fibers computed by FIDYST and the calibrated 2D model (7) with moving transport belt. Qualitatively the same fiber lay-down structures are observed. The parameter B is identified from the CT-scans data as outlined above. This leads to θ-marginal distributions as in Figures 14, 15. Simulated fibers (red) with one highlighted filament (blue). Here: FIDYST, sample I. Simulated fibers (red) with one highlighted filament (blue). Here: surrogate model, sample I. Simulated fibers (red) with one highlighted filament (blue). Here: FIDYST, sample II. Simulated fibers (red) with one highlighted filament (blue). Here: surrogate model, sample II. Marginal angular distribution p ˘ θ ( C T ) ( α , θ ) , p ˘ θ ( M ) ( α , θ ) . Here: sample I. Marginal angular distribution p ˘ θ ( C T ) ( α , θ ) , p ˘ θ ( M ) ( α , θ ) . Here: sample II. Marginal angular distribution p ˘ α ( C T ) ( α , θ ) , p ˘ α ( M ) ( α , θ ) . Here: sample I. Marginal angular distribution p ˘ α ( C T ) ( α , θ ) , p ˘ α ( M ) ( α , θ ) . Here: sample II. 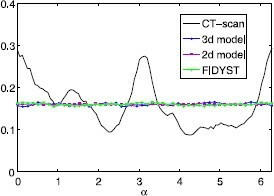 Furthermore, in Figures 8, 9 we compare the α-marginal p ˘ α ( C T ) ( α , θ ) of the CT-scan data with the corresponding distributions obtained from FIDYST simulations p ˘ α ( M F ) ( α , θ ) and from the surrogate models p ˘ α ( M 2 d ) ( α , θ ) and p ˘ α ( M 3 d ) ( α , θ ) , which can be computed with the help of (11), (where θ = π / 2 is fixed for p ( M F ) and p ( M 2 d ) ). It seems conspicious, that the large amplitude in the CT-scans is not reached by the models. On the contrary, both FIDYST and the surrogate models (7) and (9) show an almost uniform distribution, which is not surprising because of the very small speed ratio. Indeed, the surrogate models show the same quantitative behavior as the FIDYST simulation. This discrepancy between the CT-scan measurements and the models with respect to the α-distribution might be explained by the fact that the CT-scan has analyzed pieces of non-woven that had already passed through several process steps of reworking and reinforcement which had influenced the angular distribution. On the contrary, both, FIDYST and the surrogate fiber lay-down models have described the texture before post-processing. To investigate this issue more closely, it would be of great interest to have CT-scans of the deposited fibers without effects due to post-processing. Finally, we use the calibrated 3D model to simulate virtual fiber webs by superposing hundred fibers. 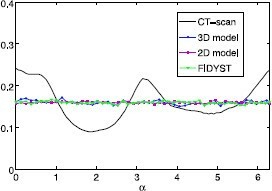 The distance of neighboring spinning positions a ≈ 0.0015 m can be determined from FIDYST simulations, whereas the nonwoven thickness d f has to be appropriately chosen in the potential V. Unfortunately, it is technically impossible to get at this parameter. We can only estimate in terms of the fiber diameter f diam . Exemplary simulations for the two samples with a presumed non-woven thickness d f = 200 f diam are shown in Figures 16-21. To compare the quality of the resulting fiber webs, we investigate the homogeneity more closely. As is common in the practical application, we look at the basis weight distribution. For this purpose, a 2D grid is placed over a fixed area of the simulated fiber web (projected to 2D) and the basis weight of each cell is numerically determined. This weight M of a given cell is proportional to the time the fiber process is present in that cell. In Figures 22-27 the relative deviations | E [ M ] − M | E [ M ] between the (expected) averaged and the actual basis weight in the cells are illustrated for different grid sizes. The standard deviations of these values give the corresponding coefficients of variation (CV-values) which are summarized in Table 3. As specimen we choose a square of size 100 cm2 for each sample. Due to the respective smaller CV-values we can state that the simulated fiber web associated to sample I is more homogeneous than the one given by sample II and hence better quality characteristics of nonwovens are expected for the machine configuration of sample I, i.e. for a slower conveyor belt. Due to the different belt speed, however, the basis weight with respect to sample II is six times smaller compared to sample I.
Simulation of a fiber web corresponding to sample I . Here: side view. Simulation of a fiber web corresponding to sample I . Here: top view. Simulation of a fiber web corresponding to sample I . Here: top view (zoomed in). Simulation of a fiber web corresponding to sample II . Here: side view. Simulation of a fiber web corresponding to sample II . Here: top view. Simulation of a fiber web corresponding to sample II . Here: top view (zoomed in). 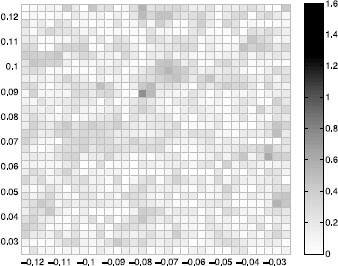 Relative deviation of basis weight per grid cell. Here: sample I, 32 × 32 -grid. 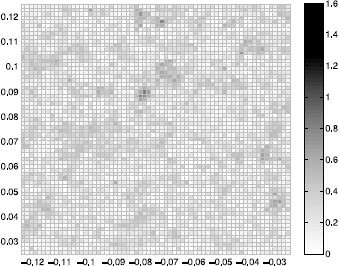 Relative deviation of basis weight per grid cell. Here: sample I, 64 × 64 -grid. 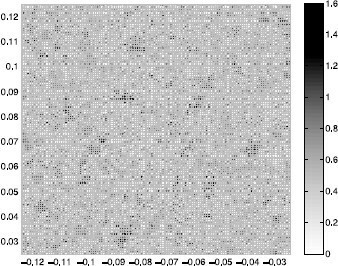 Relative deviation of basis weight per grid cell. Here: sample I, 128 × 128 -grid. 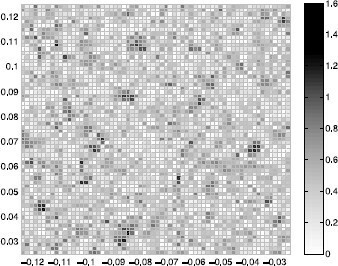 Relative deviation of basis weight per grid cell. Here: sample II, 32 × 32 -grid. 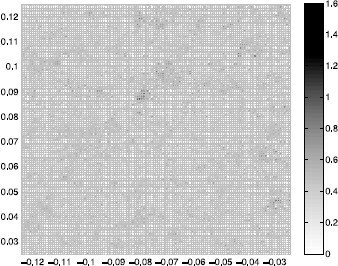 Relative deviation of basis weight per grid cell. Here: sample II, 64 × 64 -grid. 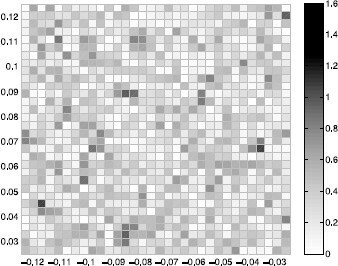 Relative deviation of basis weight per grid cell. Here: sample II, 128 × 128 -grid. We presented the application of a 3D surrogate fiber lay-down model to an industrial problem. The parameters are identified on the basis of experimental data. The calibrated model enables the efficient simulation of a whole virtual fiber web. Further modifications of the model will include, for example, the impenetrability of the fibers. This is examined in further studies. To predict material properties like permeability of the textile, the geometric model presented here has to be used as a basic model for a complex flow simulation to determine macroscopic properties of the textile. FIDYST: Fi ber Dy namics S imulation T ool developed at Fraunhofer ITWM, Kaiserslautern. This work has been supported by Bundesministerium für Bildung und Forschung (BMBF), Verbundprojekt ProFil, 03MS606. Moreover, we thank the colleagues from the departments Transport Processes and Image Processing at Fraunhofer ITWM.